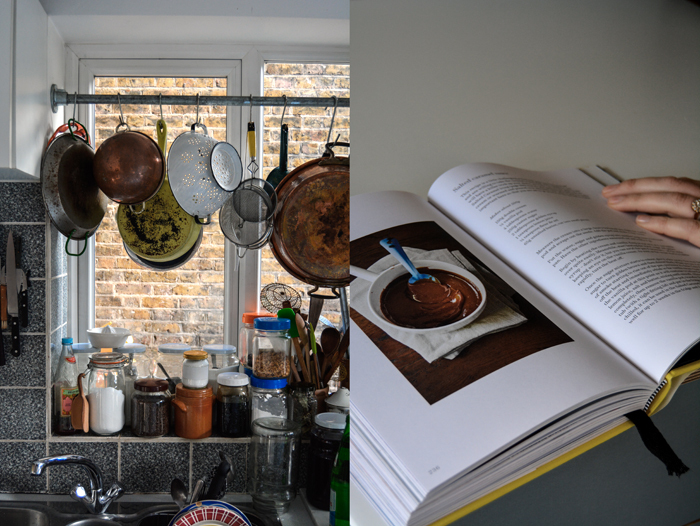 Walking down one of east London’s quiet roads lined with cute brick houses on a Sunday morning was more than pleasing, but knowing that I would enter the private kitchen of one of the most acclaimed baking goddesses of the hour piqued my excitement. I flew to London to meet Claire Ptak from California who followed the love of her life to live in Hackney and start a baking business ten years ago. She learned her profession in Berkeley, at Alice Waters’ legendary Chez Panisse, before she left California for Europe and opened a sweet stall at Broadway Market in London. Her baked goods were well received from the start, the long lines leading to her mobile shop got longer and longer every Saturday. Claire had to turn her cozy London kitchen into a busy bakery to keep up with the production, two days of hard work from the early morning until late at night before the weekly market day was her weekend routine for years. The huge demand for her utterly delicious cookies, cupcakes, pies and cakes called for a change and Violet Bakery was born. She opened a cafe in 2010 on the same street where she lives with her husband, and today it seems like this is the place that everybody is talking about when it comes to the best sweets – not only in London. Claire works with only the best ingredients, often organic, and she respects the seasons. Something she learned as a child through her parents. Growing up in a village, an hour outside San Francisco, she picked fruit from the trees and bushes in their garden when they were ripe and foraged for mushrooms and wild berries when they were in season. Her mother used to bake so many pies with her that little Claire mastered the perfect crust and fruit fillings at a young age. 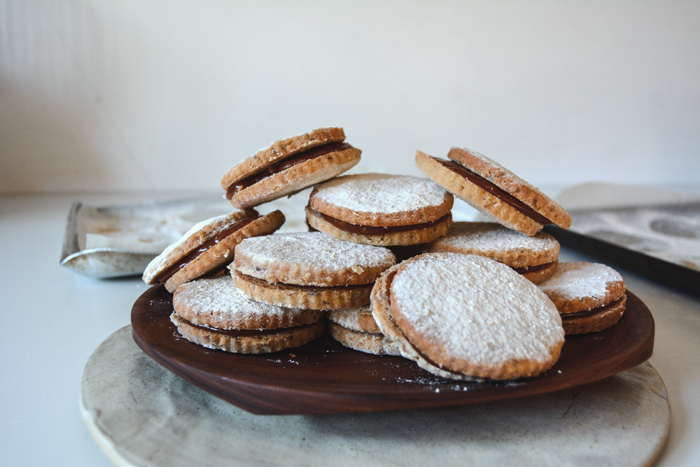 Claire has a confidence, intuition and calmness in the kitchen that impressed me as soon as she took out the baking sheets for her amazing pecan shortbread and salted caramel sandwich cookies – Alfajores, the most addictive sandwich cookies ever. She works instinctively and uses her years of experience and, as a creative mind, she takes it onto the next level. 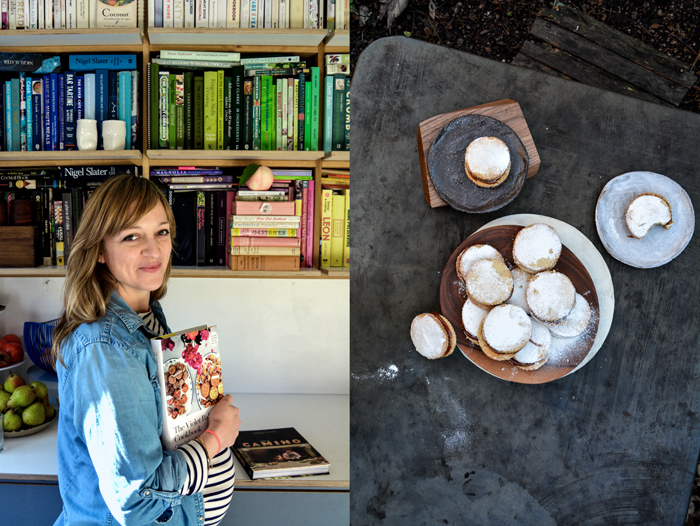 It’s not a surprise that she has already written several cookbooks, as well as her own column for The Guardian and works as a food stylist for established authors, such as Jamie Oliver and Yotam Ottolenghi. 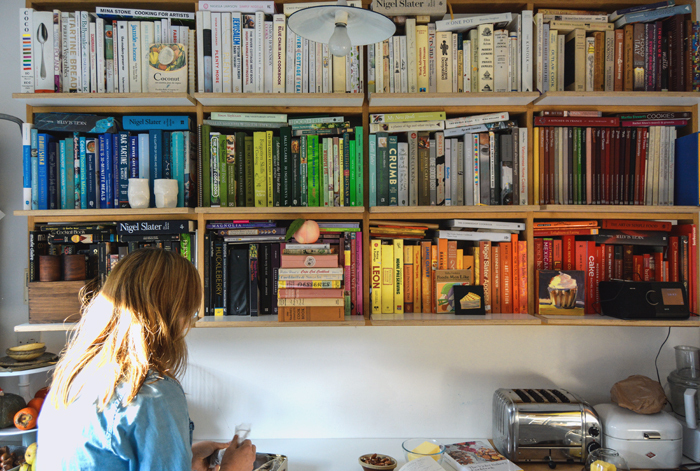 And she has one of the best cookbook collections I’ve seen in a long time! 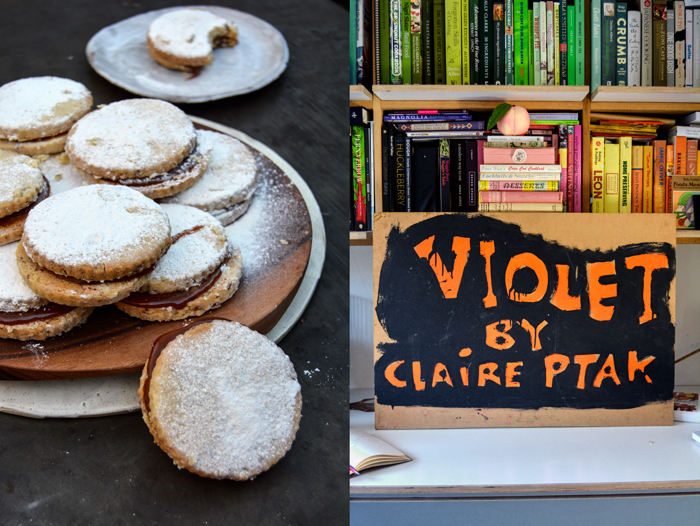 Here’s the link to Claire’s fantastic new book – a baking bible – the Violet Bakery Cookbook! Makes about 12 sandwich cookies. Cream together the butter, sugar, and salt in the bowl of an electric mixer. Add the flour and mix just to combine. Add the rum and pecans and just until it all comes together. Preheat the oven to 180°C (160°C convection setting) / 350°F (325°F convection setting). Line two baking sheets with parchment. On a lightly floured surface, roll your cookie dough out to about 3mm / 1/8″ thickness. Use a 60-70mm / 2 1/2-3″ round cutter (or a drinking glass will work too) and cut as many rounds as you can. You can re-roll to get a total about 12 sandwiches (24 individual rounds). Bake until it just starts to colour. They should move out of their spot when nudged. Sift over them with icing sugar whilst still warm and let them cool completely. Meanwhile, make the caramel. In a heavy saucepan, measure the cream and vanilla. In another large saucepan put your water, sugar and golden syrup. Have the other ingredients measured out and ready to go. Begin by heating the cream. Keep an eye on this as it can scorch quite easily. Meanwhile start heating the water, sugar and golden syrup, all the while keeping an eye on the cream. As soon as the cream starts to bubble, turn it off. Do not stir the sugar pot, but you can swirl it if need be. Once it starts to colour, give it a few swirls. You want the sugar to turn golden brown and then almost black. A swisp of smoke will start to rise out and then you know it is done. Take the caramel off the heat and immediately whisk in the vanilla cream. Don’t worry about the pod at this point as it will continue to infuse flavour. Stir in the lemon juice, salt and butter until smooth. Allow the caramel to cool before using it in the cookies. Once the caramel is cool to the touch, it can be used. Caramel will also keeps well for up to two weeks in the fridge and three months in the freezer. To assemble the sandwiches, turn 12 of the cookies upside-down and place a heaped tablespoon on caramel on top. Sandwich together with a second cookie. 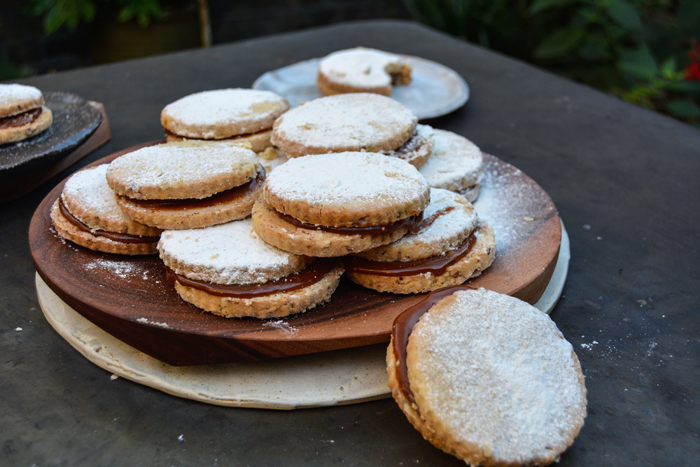 Sift over with a thick layer of icing sugar and devour! Will keep for two weeks in a cookie tin. In 2010, you opened Violet bakery and café In Hackney, east London. What moved you to take this step? I had been baking from home for 5 years but there was a moment when it had kind of taken over our home, so we decided to look for a location. Originally, I actually didn’t want to have a café, I just wanted to have my stall and have that kind of nice creative expression of what I like to cook and bake, and then do my styling and writing. I was very happy with that but there was something, I don’t know, the baked goods were so well received that it seemed crazy not to have a brick and mortar. I thought I could grow it a bit, get help, and hire good people, and I could still do the other stuff I wanted to do. Originally this was just going to be like a production kitchen for more markets but then the whole neighborhood was knocking on the door while we were fixing it up saying “this is so great, you’re opening here!”, so we thought “let’s do that”, it kind of came organically. 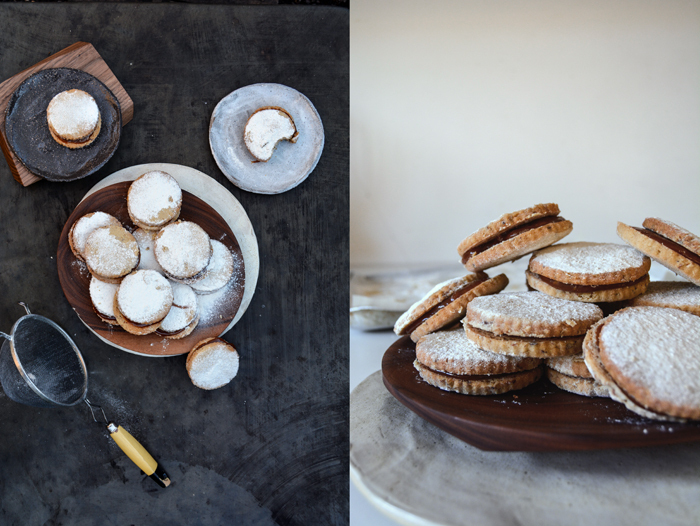 How did working as a pastry chef at Alice Water’s Chez Panisse in Berkeley influence your creative work as a baker? I was really inspired by how much they place value in the ingredients and the quality of the ingredients. That is kind of everything about what she does, it’s really about eating things at the perfect moment and that could be like a day difference. So we were going to have something on the menu and we’d think “no, actually, those pears need another day to ripen”, so we’d change the menu and do it tomorrow. And that kind of detail is so incredible when you’re working in a restaurant because, so much of the time, in restaurants, it’s just like “that’s what we’re doing, make it work, turn it out!”. And there it was “we’ll make something else and it has to be exquisite”. Every single day everything changed. You’d have a guideline of what you’re going to do but then, if things weren’t right that day, you’d change it to make it as good as it could be. So in terms of my aesthetic, because that’s so integral to how I also cook, it’s pretty natural because I think it’s really about highlighting and emphasizing the ingredients but then making them feel professional but not mass-produced. If everything looks super homemade it’s not special enough, it’s nice to have something that’s a bit of a stretch, so you’d think “I wish I could make it look that nice at home!” – it’s about giving it a little extra lift and still being natural. Have you always been more into baking than cooking? What fascinates you about baking? 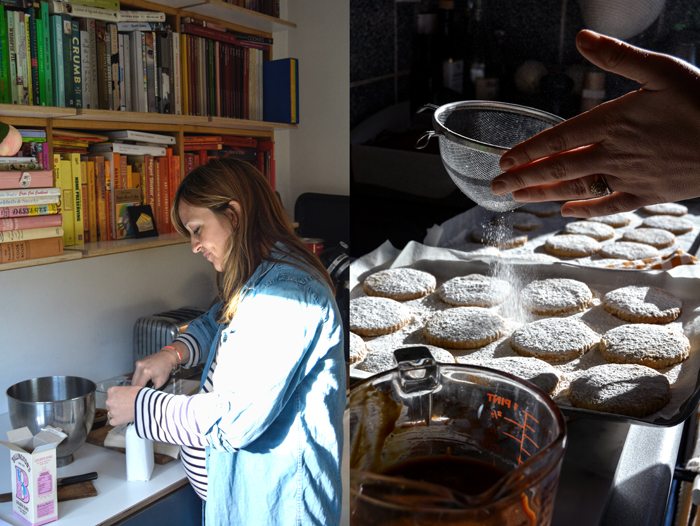 I started baking at home, with my mum and my grandmother, when she’d visit or we’d visit them. I always had an affinity for the sweet side of things but my father is also a great cook and so I’ve always cooked as well. And now, with the bakery, it’s been 10 years as a business, I’m drawn a lot more to the savory side of the kitchen. So we’ll see, I think my next book is going to have lot more savory in it. What fascinates most people about baking, is that you can start and finish a project in an hour. I think there’s nobody who doesn’t love the way that feels. To take an hour and just bake something is such a nice feeling of accomplishment. What is the hardest part about running a bakery and café? It’s managing all the staff, even though I’m so lucky, I have such a wonderful crew of people, you still have fifteen personalities, sets of emotions, and lives that you have to work within and around. I very much want to create a space where people are happy to come to work and enjoy their work. Part of having an open kitchen was about that, I don’t want to hide all my cooks in the basement. When people come in and buy the cakes the cooks just made, they get to see the reactions and appreciation. That’s so much more fulfilling as a cook. But still, it’s so challenging. Maintaining that good working environment and being a good boss is way more challenging than I ever imagined. You studied film theory and video art at Mills College in Oakland, California. Although you didn’t choose to work in this field, how did this experience influence your food business? Mills is a women’s college, it’s a great place to be, and I loved studying video art and film theory there. I wanted to go into film making, I wanted to be a writer and director. So the writing has always been there, although I wanted to write film rather than cookbooks. Somehow I also did a lot of cooking when I was in university, I did a lot of films with food in them, and I would focus on that in my work. But I ended up working for an LA director for a year and I decided that I’d rather not do that. It was brutal work and the kitchen seems like a walk in the park compared. I think I wasn’t passionate enough about it, I was more passionate about food. You grew up in California, in the San Francisco Bay Area, and now you live in London. What made you move? I grew up an hour outside San Francisco, quite a rural village, so we were picking wild blackberries and foraging, food was really central, which was great. Then I went to live in San Francisco for university and I loved the urban life as well. I was really drawn into it and I suddenly saw this whole other life. I loved the sort of country background that I have but then I really loved being in the city. I thought “this city is a small city and I’d love to see a bigger city”. I met my husband in San Francisco who’s from the countryside in England and we both thought it would be so great to live in London. So we moved here. It’s very different but with starting my business and having a real California influence on my business, I managed to make my California life incorporate into my London life. I try to bring it all together and it worked out really well. I miss San Francisco and I visit it, and whenever I go back, I think “yes, let’s live here” but at the end of three weeks I want to go back to London. In the 1960s, your parents moved to a community of intellectuals and artists, how did this lifestyle influence your relationship with food? Automatically, growing up with the seasons, having a real strong connection to nature, both cultivated and wild, because we also did foraging too, for mushrooms and berries, seafood, my brother is a great diver, you’re already close to seasonal, organic, sustainable. All the stuff that everybody talks about and that’s trendy, in real life, it’s quite different. I realize, I’m very, very lucky to have grown up with that. I encourage that philosophy coming into mainstream but I would like it to be a bit more understood. There’s the best farmers’ market in our (home) town because there are so many farmers and the weather is such that you can grow everything all year round. Just having that is pretty inspiring to cook when you have all that kind of raw ingredients around you. We had fruit trees and wild blackberries in our backyard, so my mum and I would make a pie because we had to get rid of the apples, and then, every year, you’d be so excited when the apples were falling outside. You had a real sense for when to do it and why to do it without having to have a theory behind it. What are your favourite places to buy and enjoy food in London? As a small business owner, I really value my local loyal customers who come to Violet for their morning coffee, and order cakes for special occasions. We feel so lucky to be part of a wonderful local community, and some of my favourite places in London are right on my doorstep! I regularly eat at Raw Duck, and love to browse J Glinert and Momosan Shop on Wilton Way when I’m passing by. If I’m meeting a friend for a drink after work, I love to go to Pinch on Greenwood Road. Broadway Market will always be a special spot for me, as it’s where Violet began and still has a stall every Saturday. It’s a great place to pick up flowers, bread and organic produce for the bakery. I also love Chatsworth Market, which is where the wonderful London Borough of Jam – who suppliers our jam at Violet – is based. 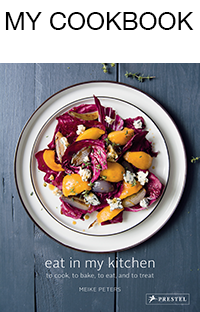 Spa Terminus is another seasoned favourite for beautiful ingredients from likeminded suppliers. And for occasions, I always choose The River Cafe. The food is so special, it’s totally worth travelling across town for. When I’m in meetings in central London, I’ll often stop at Bao Bar, which is definitely one of the shining additions to west-central eating of 2015. Richard Olney because he edited all these good cookbooks (the Time-Life book series), I would love to have met him. 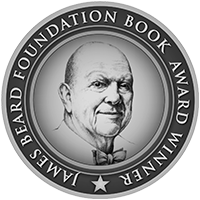 He was a great influence on Alice Waters and they were great friends, he was an American living in France. Olney cooked everything in a fire pit in the garden, anything that he would make, if it’s a little piece of lamb and some beans, that’s what I want. Or a salad, I would just love him to make me a green salad. My husband doesn’t eat meat but he eats fish, so I love to just throw a fish over some potatoes, with some herbs, bake that, and make a salad. As a kid, pie, I was obsessed with fruit pies. As we had a lot of fruit growing, we’d make pies all the time. I got really into getting the pastry right and getting the fruit right. I’m really loving English fruit cake at the moment, I think it’s because of the season. It’s cold outside and the cake is warming. 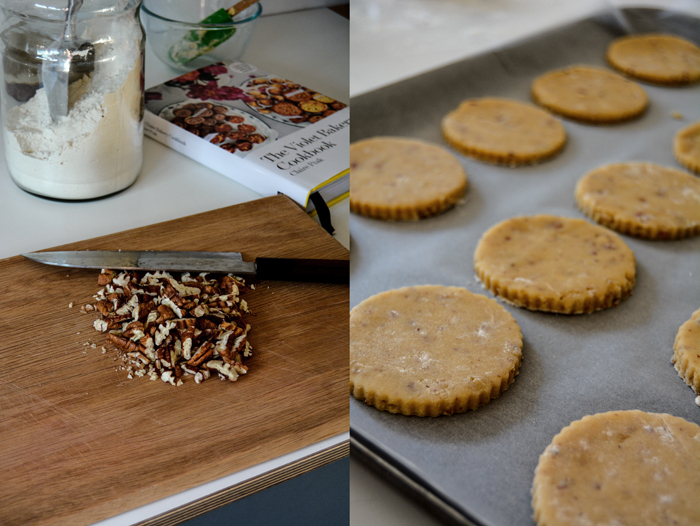 I’ve just been developing this recipe for my new column (for The Guardian) with dried figs and whiskey, it’s delish. Do you prefer to cook on your own or together with others? I love to cook with other good cooks, I can’t cook with people that don’t have the same level very well, it’s not fun. I prefer to cook with my fellow chefs, I love it. Which meals do you prefer, improvised or planned? I like a planned meal, but it will still have a simplicity to it. I like to be organized. I had a really hard time making fried chicken a year ago. I couldn’t get the oil hot enough. I made a mistake of having a huge pot of oil because we had so many people, rather than just quickly frying it in less oil. And it was so frustrating, it tasted amazing but it was pale.